Release 154: Compass Landmarks and Warps Cost! Added darker night time lighting. Removed greenish values from the night sky cubemap. Added new restrictions to remove/place blocks to connected powercores. Fixed a crash caused by placing a machine next to pipes connecting multiple powercore groups. Fixed held torch and totem beam not playing audio. Fix for creatures spawning on surfaces inside a beacon but with the block above not inside a beacon. Added compass location text to display the player’s world and closest region. 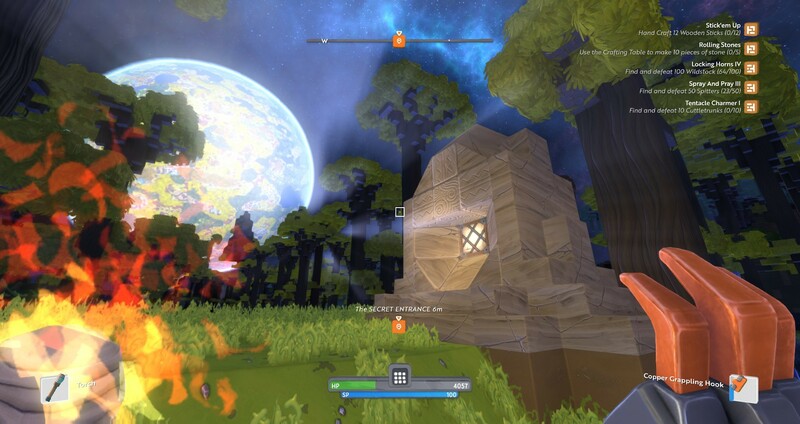 Updated compass information when a player is inside a beacon. Updated GUI glyph colours to represent the relationship with the player. Locations in the warp conduit screen now display current/required coin and conduit block counts to activate the warp to the given location similar to crafting interfaces. Locations in your inventory now display their distance based on the world you’re currently on. Trying to activate a warp that will leave you without enough coins to return will pop up a dialog to confirm the action. Warps now have a requirement on the size of the warp depending on the distance travelled. Travelling further requires a physically larger warp. This does not apply to the Sanctum. Warps now have costs determined by the distance travelled in the universe, calculated by the number of hops in the world graph. Chat UI overlaps with Game Log UI. Grappling hooks will occasionally be left on the ground. Grappling hooks will occasionally go through blocks. Occasional crash may occur when using grappling hook. Buying plinths that had wanted items set before v151 have unset them. Sorry. Going forward they will be fine. Chat text overlaps with HUD Text in the centre of the screen. Entity rendering will not always work correctly when there are multiple warps very close together, or where a warp opens up to a location very near where the entrance is. Gem grappling hooks retract automatically when hanging. Shift-clicking an item from the selling plinth will show odd numbers and will not always go in the shopping basket. Shift-clicking and dragging on the coin icons from within the trading menus may cause a crash. Some Extractor machines lack animation. Some interactive blocks (crafting table, machine, beacon control) have become corrupted during the migration. This will result in at best those blocks not being able to be interacted with, at worst the game crashing when interacting with those blocks. To fix the issue the block(s) in question need to be re-placed. In the case of anything other than a beacon control the block can simply be broken, picked up, and then re-placed. In the case of a beacon control this will work, although it would result in all the plots having to be re-placed one at a time and during that process the contents being unprotected. A better workaround for a beacon control is to craft a new beacon control, place that, and then break the old one, which will keep the beacon’s plots placed throughout the process. The recipes are not final. Z-fighting with some items (workbench and other machines) when placed underwater. Fixed issue with the calculation of Warps between worlds. Reduced Warp costs to be consistent with the player progression currently in game. Weekly Dev Update: 2017 February 3rd - Rolling Hopper, Stats, and Elements! Excellent! So happy about the landmark system! A lot of good progress! Landmarks and other changes are great. Not so happy about the warp cost so high with so few ways to make coin. maybe on world portals could be 100 and the intra planet 300? (once fixed) I think 3200 to get from US West to EU is a bit steep. With the value of items it would be cost ineffective to do any real moving of goods from one world to the next with the price that high. I think the addition of coin sources should have preceded the price hike of travel. What once was 500 (1k round trip) to the market on EU (Which is the only real active market on the servers) is now 6400 round trip?!? I think its time to take a break until the coin & warp costs level out. Yeah 500k coin to get back home for me, its a bug but seriously I live on Elopor and the way warps work now is going to be tough. Besides higher costs for most travelers in general anyone who lives on a moon is getting the shortest end of the stick. I really disliked the grapple changes and am not a big fan of these new travel costs. Hope something comes out soon that will help with this. 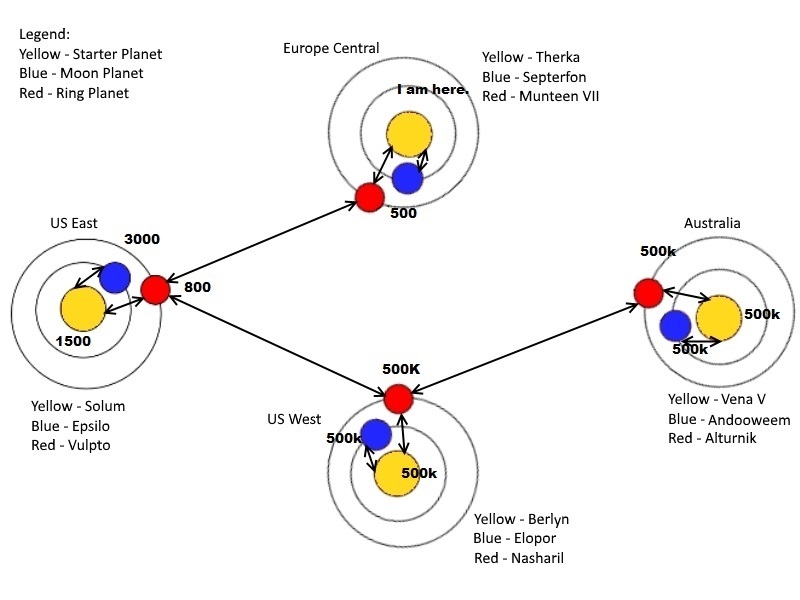 Also if this is the system that’s going to be implemented permanently It would be great to have more centralization in mind with planet creation so people can have an easier time reaching markets. Try jumping one planet at a time to get to where you want to go vs warping directly to your destination planet, it is cheaper and it seems that is what they want you to do. Might have been a good idea to consider your own point there whilst making the only functional planet-hop system far less feasible to use. Yea that seems like a bug. A very big bug. I would not have released this without portals. Making warp costs higher is a good way for people to better think before they travel to a planet. So far, I just went for a few minutes to a planet and back again because I had enough coins. But now it’s expensive/difficult. I think the reason behind this is that you rather build a portal if you want to visit one planet more often. But first you have to get there with a warp before you do. And 500k must be a bug. I don’t think this is the right cost. I love the new feature! Sorry guys. It is a bug. It should not be this expensive. We are looking into this now. Thanks for the help. The pic below shows how wrong the warp pricing is. Updated OP with details of 154.1. Thank you for the cost update, this is much better and it looks like it is calculating correctly! I am sure an increase will be due once other coin earning functions exist, but for now this is such a relief. Thank you! I’ve been out of Oort/Boundless since Release 100. The dev updates always mention the “live” version. What other version is there? How do I know if I’m on the “live” version? I think I made the mistake before and never really saw anyone. I’ve been tooling around on Solum, and I see some other player builds, but I still have no idea if I’m on the right version, lol. Seems like a silly question. TY! The dev updates always mention the “live” version. The live version is one of two version available to “normal players” (not devs). If you disabled all “Betas” (in the steam game options menu) your are in the “stable version” (there you can find some players). I’m sure this is what they mean with “live” if they refer to like above. If you participate in the “testing” beta, I’m sure you won’t find a lot of players. @Heurazio Thanks! I tried switching to the beta for a little bit, and it through me into the Australian server, which doesn’t work for me. I appreciate the clarification.